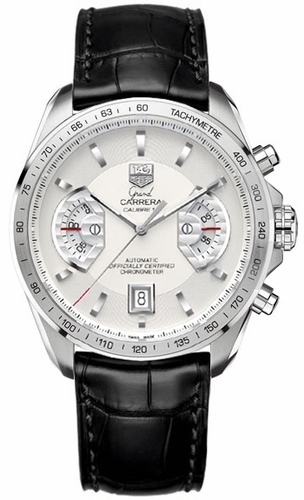 Tag Heuer’s Grand Carrera line of watches is “the premium avant-garde collection inspired by a motor racing heritage.” Specifically, the Grand Carreras pay homage to GT race cars, and are an expression of passion as well as precision time measurement. The tribute to racing is evident in the Grand Carrera CAV511B.FC6225, which substitutes the traditional round chronograph sub-dials with dashboard style disc gauges. This sporty men’s timepiece also features a crystal case back revealing the watch’s inner workings, giving watch aficionados the same satisfaction as a car enthusiast popping the hood on a dragster. They also make precision time keeping easy, offering clear readouts at just a glance. Other permutations of this timepiece are available featuring either a black or silver dial with a stainless steel link bracelet or black leather alligator strap. Drawbacks: With the rigorous quality control testing of the Grand Carrera CAV511B.FC6225, there really are no downsides to owning this sharp, sporty timepiece. If you can afford the $6600 price tag, this watch will not disappoint. That looks like the wrong picture — doesn’t match description, and a web search on CAV511B.FC6225 pulls up a much different-looking watch. Thanks for the heads up, corrected.